Penaeus monodon nudivirus (PmNV) is the causative agent of spherical baculovirosis in shrimp (Penaeus monodon). This disease causes significant mortalities at the larval stage and early postlarval (PL) stage and may suppress growth and reduce survival and production in aquaculture. The nomenclature and classification status of PmNV has been changed several times due to morphological observation and phylogenetic analysis of its partial genome sequence. In this study, we therefore completed the genome sequence and constructed phylogenetic trees to clarify PmNV’s taxonomic position. To better understand the characteristics of the occlusion bodies formed by this marine occluded virus, we also compared the chemical properties of the polyhedrin produced by PmNV and the baculovirus AcMNPV (Autographa californica nucleopolyhedrovirus). We used next generation sequencing and traditional PCR methods to obtain the complete PmNV genome sequence of 119,638 bp encoding 115 putative ORFs. Phylogenetic tree analysis showed that several PmNV genes and sequences clustered with the non-occluded nudiviruses and not with the baculoviruses. We also investigated the characteristics of PmNV polyhedrin, which is a functionally important protein and the major component of the viral OBs (occlusion bodies). We found that both recombinant PmNV polyhedrin and wild-type PmNV OBs were sensitive to acid conditions, but unlike the baculoviral OBs, they were not susceptible to alkali treatment. 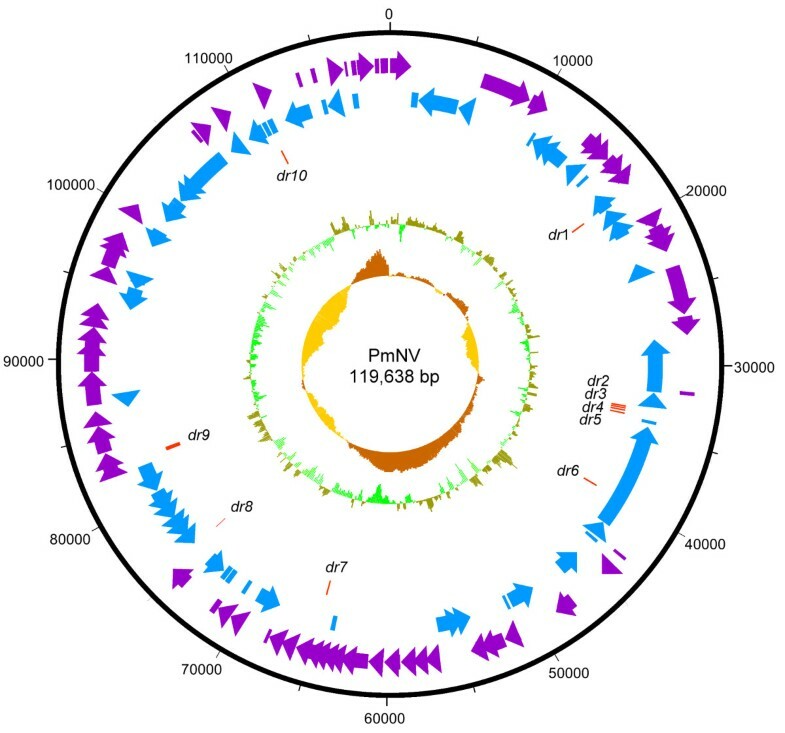 From the viral genome features and phylogenetic analysis we conclude that PmNV is not a baculovirus, and that it should be assigned to the proposed Nudiviridae family with the other nudiviruses, but into a distinct new genus (Gammanudivirus). Spherical baculovirosis is a shrimp disease that was first observed in Taiwan, and it was also the first reported viral disease from Penaeus monodon. The viral pathogen that causes this disease is now widely distributed along the Indo-Pacific coasts of Asia, and it infects a range of penaeid shrimps. The virus is a rod-shaped, singly enveloped and occluded large circular dsDNA virus that replicates within the nucleus, and it targets several organs, including the hepatopancreatic tubule epithelium and duct epithelium of postlarvae, juveniles and adults, and the anterior midgut epithelium of very young postlarvae . When it was first discovered in 1981, it was thought to be a baculovirus because of the structure of its occlusion bodies as revealed by electron microscopy . Two years later, it was designated monodon baculovirus (MBV) , and this name is still commonly used today. One decade after its discovery, Mari et al. showed that each envelope contained a single nucleocapsid, and that numerous virions were included within each occlusion body. Mari et al. therefore proposed that MBV be assigned to the subgenus SNPV with the name PmSNPV . Later still, from 2005 to 2011, in the 8th report of the International Committee on Taxonomy of Viruses (ICTV), Penaeus monodon nucleopolyhedrovirus (PemoNPV) was listed as a “tentative species” in the Nucleopolyhedrovirus genus. Meanwhile, even though the virus forms occlusion bodies, in 2009, Wang and Jehle used a molecular phylogenetic analysis of six viral genes and supermatrix methods to propose that this virus should to be re-assigned to the genus Nudivirus. They also proposed that it be renamed to P. monodon nudivirus, PmNV . Although the taxonomic status of this virus is still in dispute, and it is not included in the 9th ICTV report (2012), the evidence we present here supports this proposed reassignment, and we will use this new name throughout the present manuscript. Before the present study, only a 22.8 Kb partial PmNV genome sequence was available in GenBank. To further clarify its phylogenetic status, we used an NGS (Next Generation Sequencing) platform to determine the complete genome sequence of PmNV, and then analyzed and compared its genomic features with other closely related species. We also investigated the unique properties of the polyhedrin that forms PmNV’s occlusion bodies. Our results suggest that PmNV is not a baculovirus, and we propose that it should be assigned to a third genus, Gammanudivirus, within the newly proposed Nudiviridae family . The complete PmNV genome was sequenced by an Illumina Miseq sequencer using the paired-end method. High-throughput sequencing was performed twice to compare between different sample preparation methods and sequencing conditions. The longest contigs from the first and the second sequencing were 119,426 and 119,128 nt, respectively. However, high-throughput NGS sequencing can produce nucleotide errors, while the short sequences used by NGS can lead to repetitive errors in assembly. Therefore, based on the longest contig, we designed 374 primers (Additional file 1: Table S1) and used Sanger sequencing to recheck sequences that had unreliable signals. A total of 754 runs were assembled into a single contiguous sequence with a size of 119,638 bp. Comparisons of this sequence with the two high-throughput contigs found a 1 nt insertion and a total of 211 nt deletions in the contig from the first high-throughput sequencing, and 3 nucleotide errors and 556 nt deletions in the contig from the second high-throughput sequencing (Additional file 2: Table S2). Although the second sequencing produced about 3 × more data than the first, its mapping rate was about 3 × lower, and overall, the mappable reads were almost the same (Additional file 3: Table S3). Since these two high-throughput sequencings were performed on samples of viral genomic DNA with different purity and concentration, the similarity of the two sequencing results therefore suggests that good results can be obtained even when the sample is contaminated with host DNA as long as there is sufficient coverage for accurate assembly. 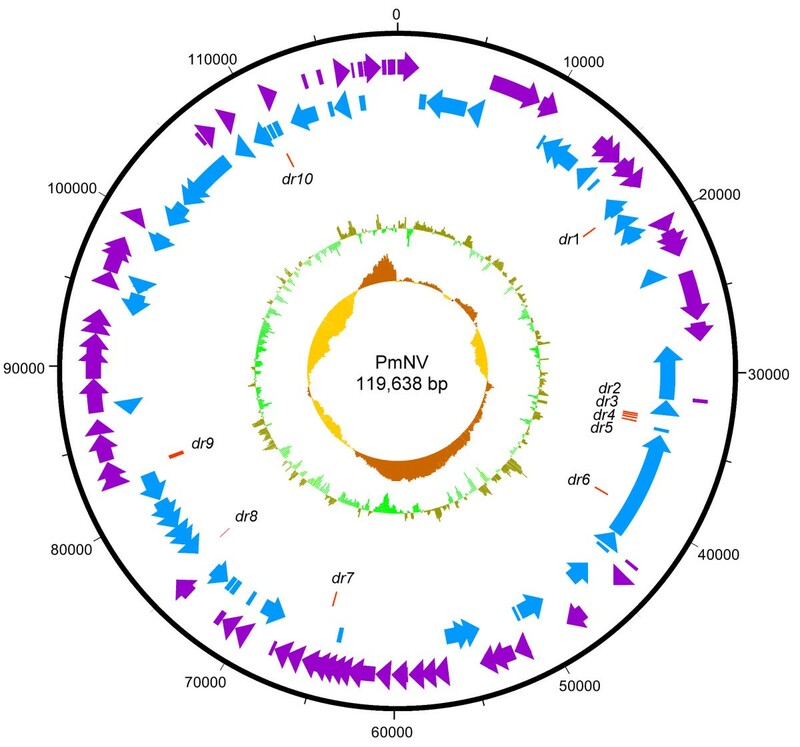 We conclude that the complete circular genome of PmNV is 119,638 bp in size. This length is in good agreement with the 80-160 kb estimated by BamHI digestion . The PmNV genome has a G + C content of 34.5%, which is lower than the G + C content of the type species of the baculoviruses (AcMNPV) and all but one of the four nudiviruses (Table 1). Homology regions (hrs) are an important feature in the genomes of many dsDNA viruses. These regions, which are AT-rich and consist of direct repeats with imperfect palindrome sequences, play a central role in replication [11–13] and also act as transcriptional enhancers . hrs vary in length, sequence and copy number between species, and most of the baculoviruses have several hrs distributed around their respective genomes. Notable exceptions include Trichoplusia ni single nucleopolyhedrovirus (TnSNPV) , Chrysodeixis chalcites nucleopolyhedrovirus (ChchNPV)  and Agrotis segetum granuloviruses (AgseGV) , none of which have any hrs. To date, no hrs have been found in any of the fully sequenced nudiviruses, ie. HzNV-1 (Heliothis zea nudivirus 1) , HzNV-2 (Helicoverpa zea nudivirus 2) , GbNV (Gryllus bimaculatus nudivirus)  and OrNV (Oryctes rhinoceros nudivirus) . The PmNV genome also does not include any hrs. Like the nudiviruses, however, it does include a number of tandem direct repeats (dr; Additional file 4: Table S5). Four of these repeats (dr2-5) cluster together between locations 33,271 and 33,962 in the PmNV genome, which is predicted to be a non-coding region (Figure 1). The repeat unit, copy number and total length of the repeats range from 3 to 42 bp, 2.0 to 8.7 and 26 to 284 bp, respectively, which means that repeat sequences are less abundant in PmNV than in, for example, HzNV-2. Taken together, these results suggest that PmNV and the nudiviruses might have a replication origin pattern which is distinct from the baculoviruses. Circular map of the PmNV genome. Purple represents the 60 forward strand ORFs and blue represents the 55 reverse strand ORFs. Red represents the 10 direct repeat (dr) regions, which are dispersed around the genome. The innermost circle shows GC skew, which indicates possible locations of the DNA leading strand, lagging strand, replication origin, and replication terminal during DNA replication. Below average GC skew is light orange and above average dark orange. The next innermost circle is a GC plot, with light green representing below average GC content, and dark green indicating above average GC content. The ORFs predicted by DNAMAN and the online programs GeneMarkS, GLIMMER3 and FGENESV0 are shown in Additional file 5: Table S4. The A of the ATG start codon of the PmNV001 (polyhedrin gene ) was defined as nucleotide 1 of the PmNV genome. To reduce the number of false positives and improve accuracy, only those ORFs that were predicted by at least two programs or which had an E-value of less than 1 in the BLASTP search were selected for further analysis. In total, 60 predicted ORFs were found on the forward strand and 55 predicted ORFs on the reverse strand, with sizes ranging from 144 bp to 7.5 kb (Figure 1). The average length of the predicted ORFs was about 990 bp and the gene density was 1.04 per kb. Eight of the 115 putative ORFs (PmNV003, PmNV006, PmNV016, PmNV033, PmNV049, PmNV067, PmNV073 and PmNV113) are similar to proteins found in eukaryotic organisms, while 45 ORFs (39% of 115 putative ORFs) have significant homologies to genes found in other dsDNA viruses (Table 2). Homologous genes were found especially in two closely related nudiviruses with 93% sequence identity, HzNV-1 and HzNV-2 . By comparison, the Baculoviridae share 37 core genes among the Alphabaculovirus, Betabaculovirus, Gammabaculovirus and Deltabaculovirus, 20 of which are also homologous to nudivirus genes . Except for vp39, PmNV has the same homologous genes as the nudiviruses (Table 2). In addition to the nudiviruses and baculoviruses, PmNV also shares some homologous genes with the bracoviruses and hytrosaviruses, two viral groups that are closely related to the nudiviruses and baculoviruses (Table 3). *In HzNV-1 both fused in the same ORF and appear to be fused into a single gene. **The PmNV genome contains two ORFs that are homologous to vlf-1 and to odv-e66. #Despite the [low] identity and similarity between PmNV020 and other polyhedrons from AcMNPV and the nudiviruses, this ORF does not in fact seem to express a functional polyhedrin. ##PmNV001 is a functional homolog of polyhedrin that shows no sequence homology to AcMNPV polyhedrin. Bracoviruses and hytrosaviruses are included for comparison. *The PmNV genome contains two ORFs that are homologous to helicase 2. **“HzNVORF” genes use the HzNV-1 ORF number. Identity and similarity values in Tables 2 and 3 were calculated by ClustalX2 and GeneDoc and are different from the BLASTP results in Table 4 and in the text. Gene parity plots that compared the gene organization of PmNV’s predicted ORFs with those of two representative nudivirus species, HzNV-1 and OrNV, showed no significantly similar pattern of gene location within the respective genomes (Additional file 6: FigureS1). However, gene parity is not generally conserved in either baculoviruses or nudiviruses, and we note that the conserved gene cluster of helicase and pif-4 (19 kDa) that is found in the known nudiviruses  was in fact also detected in the PmNV genome (PmNV094 and PmNV096) though in opposite orientation (Additional file 7: FigureS2). This suggests that PmNV has a closer evolutionary relationship to the nudiviruses than to other large dsDNA viruses. The PmNV genome includes two ORFs, PmNV005 (dna polymerase) and PmNV094 (helicase), that are involved in DNA replication and play essential roles in DNA polymerization and DNA unwinding, respectively. Two other enzymes LEF-1 and LEF-2, which are factors essential for primase activity in baculoviruses, did not have any homologs in PmNV. PmNV005 was predicted to belong to the DNA polymerase type-B family, and it has the POLBc signature from 151-304 aa (Pfam: E = 1.5 × 10-19). The closest matches for PmNV005 are the DNA polymerases of HzNV-1 and HzNV-2, which both have 26% amino acid identity (BLASTP: E = 2 × 10-102; Table 4). DNA polymerase is a key enzyme in virus taxonomy, and it has often been used to construct phylogenetic trees of DNA viruses. In Figure 2A, the putative PmNV DNA polymerase protein sequence (PmNV005) was aligned with DNA polymerase sequences from closely related dsDNA viruses, including baculoviruses, nudiviruses and hytrosaviruses (as an outgroup), and subjected to phylogenetic analysis. Each node had a high bootstrap support percentage, indicating that this tree was reliable. PmNV was on a branch that was distant from the baculoviruses and closely related to the nudiviruses, which is consistent with the result reported by Wang and Jehle  for the partial PmNV genome sequence. Except for HzNV-1 and HzNV-2, the tree lengths show that there are greater evolutionary distances between the nudiviruses than between the baculoviruses. Phylogenetic analysis of selected DNA viruses and PmNV. Multiple alignments of (A) DNA polymerase, (B) Helicase, (C) LEF-4, LEF-5, LEF-8, LEF-9 and P47 (D) P74, PIF-1, PIF-2 and PIF-3 protein sequences were performed using BioEdit. The trees were inferred using MEGA5.2 and the neighbor-joining method. The robustness of each tree was tested using bootstrap (1000) analysis. The percent values are indicated at the nodes. Organisms included in this analysis, with abbreviated names: Autographa californica multiple nucleopolyhedrovirus (AcMNPV), Bombyx mori nucleopolyhedrovirus (BmNPV), Lymantria xylin nucleopolyhedrovirus (LyxyMNPV), Cydia prmonella granulovirus (CpGV), Agrotis segetum granulovirus (AgseGV), Spodoptera litura granulovirus (SpliGV), Neodiprion sertifer nucleopolyhedrovirus (NeseNPV), Neodiprion lecontei nucleopolyhedrovirus (NeleNPV), Neodiprion Abietis nucleopolyhedrovirus (NeabNPV), Culex nigripalpus nucleopolyhedrovirus (CuniNPV), Heliothis zea virus 1 (HzNV-1), Helicoverpa zea nudivirus 2 (HzNV-2), Oryctes rhinoceros nudivirus (OrNV), Gryllus bimaculatus nudivirus (GbNV), Musca domestica salivary gland hypertrophy virus (MdSGHV), Glossina pallidipes salivary gland hypertrophy virus (MdSGHV), African swine fever virus (ASFV). Accession numbers of all the sequences are listed in Additional file 8: Table S6. PmNV094 showed 28% identity with helicase from HzNV-1 and HzNV-2 (BLASTP: E = 3 × 10-19; Table 4) and was predicted to contain the primase_Cte domain (CDD: E = 4.99 × 10-7). In the phylogenetic tree based on the helicase protein sequences of baculoviruses and nudiviruses, which also had a high bootstrap support percentage at each node, PmNV again formed a cluster with HzNV-1 and HzNV-2 (Figure 2B). As with dnapol, evolutionary distances between the nudiviruses and PmNV are still greater than those within the baculoviruses. Five putative genes, PmNV014 (p47), PmNV023 (lef-8), PmNV052 (lef-5), PmNV058 (lef-9) and PmNV091 (lef-4), are homologous to those involved in baculovirus transcription. These genes are expressed in the late or very late infection stage, and they play different transcriptional roles. LEF-5 is a transcription initiation factor , while P47, LEF-4, LEF-8 and LEF-9 are RNA polymerase subunits. Although p47 and lef-9 are fused into a single gene in HzNV-1 and HzNV-2, all five of the genes in the transcriptional group are conserved between the baculoviruses and nudiviruses (Table 2), which suggests that the baculoviruses and nudiviruses share a similar mode of transcription.For the phylogenetic analysis (Figure 2C), the protein sequences of LEF-4, LEF-5, LEF-8, LEF-9 and P47 from the nudiviruses and selected baculoviruses were arranged sequentially and then aligned. In this tree, PmNV also formed a cluster with the nudiviruses. The tree showed a relatively large evolutionary distance between the baculovirus cluster and the nudivirus cluster. PmNV010 (pif-5/odv-e56), PmNV015 (pif-2), PmNV039 (pif-1), PmNV072 (p74), PmNV088 (pif-6), PmNV093 (pif-3) and PmNV096 (pif-4) were homologous to genes involved in per os infection. These seven genes are conserved across the baculoviruses and nudiviruses, and they are all essential for the occlusion derived virus (ODV) infectivity of the baculoviruses, either by specific binding to the midgut cells (P74, PIF-1 and PIF-2) [22, 23] or by a mechanism that has not yet been determined (PIF-4, PIF-5 and PIF-6) [24–26]. Although PIF-3 was shown not to be involved in specific attachment and fusion , deletion of its N-terminal nuclear localization signal prevents per os infectivity . The shared importance of these per os infectivity factors implies that despite the absence of OBs in the nudiviruses, these viruses nevertheless all share a very similar oral infection mechanism. Moreover, four homologous genes that have relatively high identity and similarity (p74, pif-1, pif-2 and pif-3) are also found in the hytrosaviruses, indicating that the baculoviruses, nudiviruses and hytrosaviruses all have the same important ancestral conserved model for virus infectivity. Interestingly, BLASTP search showed that PmNV015 (pif-2) most closely matched Macrobrachium nudivirus (MRNuV) PIF-2 (Accession No. : AFP33714) with an identity of 66%. To date, only one other MRNuV gene has been sequenced (IAP), but we note that unlike the other insect nudiviruses, both PmNV and MRNuV are aquatic viruses, and it is possible that these two viruses - perhaps together with Penaeus vannamei single nucleopolyhedrovirus, PvSNPV - are quite closely related. The constructed phylogenic tree of the oral infectivity genes p74, pif-1, pif-2 and pif-3 (Figure 2D) is similar to the DNA polymerase and Helicase trees, providing further evidence that PmNV is more closely related to the nudiviruses than the baculoviruses. There are 18 baculovirus core genes involved in viral structure formation, but only four of these genes have homologs that could be found in the PmNV genome: p33 (PmNV008), vp91 (PmNV009), vlf-1 (PmNV056 and PmNV090) and 38 k (PmNV059) (Table 2). The PmNV genome even lacks a homolog to vp39, which is found in the nudiviruses and is thought to encode the major capsid protein . 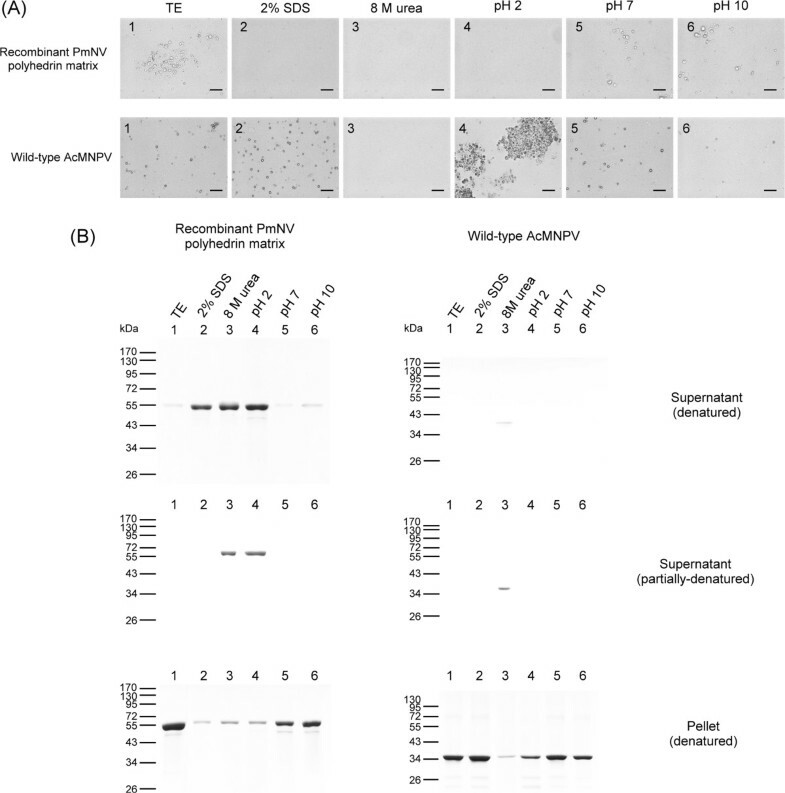 P33 is a component of the occluded virions of AcMNPV, CuniNPV (Culex nigripalpus nucleopolyhedrovirus) and HzSNPV (Helicoverpa zea single-nucleocapsid nucleopolyhedrovirus) [29–31]. AcMNPV P33 has been shown to interact with the human tumor suppressor p53 to enhance p53-induced apoptosis . However, while AcMNPV P33 also interacts with Spodoptera frugiperda P53 (SfP53) and oxidizes SfP53 in vitro, it does not enhance SfP53-mediated apoptosis in Sf9 cells . AcMNPV P33 has also been demonstrated to have sulfhydryl oxidase activity  and it is required for budded virus production and for the formation of multiply enveloped occlusion-derived nucleocapsids . VP91 is expressed at the late stage of viral infection and is present in the capsid structure of OpMNPV (Orgyia pseudotsugata multicapsid nucleopolyhedrovirus) . VLF-1 is expressed at the very late stage and is involved in the production of the AcMNPV nucleocapsid . Gene 38 K is essential for budded virus formation and the nucleocapsid assembly of AcMNPV . Taken together, the low number of homologs in this functional group indicates that the baculoviruses and nudiviruses are highly divergent in terms of their viral structural proteins. The best match to PmNV086 was the Ac81-like protein of HzNV-1 and HzNV-2 (BLASTP: E = 3 × 10-21) (Table 4). In BmNPV (Bombyx mori nucleopolyhedrovirus), the Ac81 homolog (ORF67) is a non-structural protein of unknown function that interacts with host actin . The protein sequence encoded by PmNV086 was predicted to have a transmembrane domain by SMART, and Pfam found a partial match (E = 0.16) in the eukaryotic RHD3 protein (Root hair defective 3 GTP-binding protein). We found four other putative PmNV ORFs homologous to baculovirus genes that are not included in the 37 core genes: PmNV006 (methyltransferase), PmNV034 (odv-e66), PmNV036 (odv-e66), PmNV106 (iap) (Table 2). Methyltransferase is expressed in the late phase of infection and has cap O-dependent methytransferase activity . However, deletion studies with methyltransferase-defective AcMNPV have shown that it is not essential for the budded virus or for occluded virus production, and that it has no effect on AcMNPV . The PmNV genome has two neighboring ORFs with the same orientation (PmNV034 and PmNV036) that are homologous to odv-e66. ODV-E66 is a late expression, structural component of occluded-derived virus (ODV) envelopes . The N-terminus of ODV-E66 contains a highly hydrophobic INM-sorting (inner nuclear membrane-sorting) motif that traffics AcMNPV viral proteins to enhance viral assembly . However, despite their homology, PmNV034 and PmNV036 have different lengths, relatively low identity and similarity (38% and 53%, respectively), and the hydrophobic INM-sorting sequence was found only in PmNV036 and not in PmNV034. AcMNPV ODV-E66 has also recently been shown to act as a chondroitin lyase . Interestingly, both PmNV034 and PmNV036 contain all five of the conserved catalytic residues that are found in AcMNPV ODV-E66, suggesting that either or both of these proteins might function as a chondroitin lyase. PmNV106 contains a single predicted BIR (baculoviral inhibitor of apoptosis repeat) domain. This domain acts directly on the caspase family of protease enzymes to block apoptosis and thereby allow the virus more time to replicate. The IAP (inhibitor of apoptosis) family of proteins contains 1 ~ 3 BIR domains in the N terminal and an optional RING domain in the C terminal. PmNV106, which lacks a predicted RING domain and is shorter than most other IAPs (Additional file 8: Table S6 and Additional file 9: Figure S3), shares an identity of less than 60% with other IAPs. The PmNV genome contains two ORFs with some homology to polyhedrin, PmNV001 and PmNV020. LC-MS analysis has shown that the polyhedrin protein purified from PmNV occlusion bodies is derived from PmNV001 . Meanwhile, although three nudivirus ORFs (Hz1V068, OrNV ORF16 and GbNV ORF65) were previously reported to show some homology to AcMNPV polyhedrin , and our BLASTP search also found a fourth match in Hz2V070, there is no functional evidence that polyhedrin protein is actually expressed by any of these ORFs. The evolutionary relationship between these low identity, possible polyhedrin nudivirus homologs and baculoviral polyhedrin still remains unclear, but we tentatively conclude that PmNV020 is unlikely to be a polyhedrin gene. PmNV polyhedrin is discussed in more detail in the second half of this study. The PmNV genome contains four putative ORFs, PmNV 020 (DNA excision and repair) PmNV055 (integrase), PmNV076 (helicase2) and PmNV079 (helicase2), that are homologous to genes involved in DNA replication. PmNV020, in addition to being a homolog to four nudivirus ORFs that are homologous to AcMNPV polyhedrin, has a predicted 29% amino acid identity with Hz1V068 and Hz2V070 (BLASTP: E = 3 × 10-14). A Pfam database search revealed that the N-terminus of all three proteins matched the XPG (Xeroderma pigmentosum complementation group G) N-terminal domain with E-values of around 0.03 (PmNV020 33-110 aa = 0.03, Hz1V068 = 0.027 and Hz2V070 = 0.028). The presence of this domain in Hz2V070 led Burand et al. to propose that it is a DNA excision and repair enzyme that restores damaged DNA. Homologs of this enzyme are found among the nudiviruses and in the Musca domestica salivary gland hypertrophy virus (MdSGHV), but not in the baculovirus genomes. The baculoviruses encode various other proteins for DNA repair instead. For example, some of the nucleopolyhedroviruses use photolyase to repair UV-damaged DNA . PmNV055 (integrase) most closely matched the integrase of HzNV-1 (BLASTP: E = 1 × 10-32) (Table 4), which phylogenetic analysis suggests was formed by duplication of the baculovirus and nudivirus conserved vlf-1 gene . PmNV055 is predicted to belong to the phage integrase family (Pfam: PmNV055 105-278 aa, E = 7.8 × 10-16). Members of this family mediate unidirectional site-specific recombination between two DNA recognition sequences . Tyrosine is the key catalytic site of this enzyme activity, and a catalytic tyrosine was found on one of the six possible active sites of PmNV055 predicted by Pfam. Integrase mediates the excision and integration of viral genetic material into the host genome. This process is essential for Microplitis demolitor bracovirus (MdBV) , and HzNV-1 also has a similar mechanism that integrates viral DNA into the host chromosome for persistent infection . However, it is still unclear if this protein has any functional role in PmNV. BLASTP found that PmNV076 and PmNV079 both matched the same Danaus plexippus protein with an identity of 30% (E = 1 × 10-46) and 28% (E = 5 × 10-39), respectively (Table 4). The same two ORFs also matched HzNV-1 putative helicase 2 with 27% identity (BLASTP: E = 1 × 10-39 and 7 × 10-35, respectively). However, these two ORFs have relatively low amino acid sequence identity and similarity (17% and 35%, respectively), which means that if they really are homologs to helicase 2, then the original gene duplication must have occurred a long time ago. The genomes of the other sequenced nudiviruses each contain only a single instance of a gene that is homologous to helicase 2. Four putative ORFs, PmNV045 (PmV-like), PmNV069 (HzNVORF106-like), PmNV090 (HzNVORF140-like) and PmNV107 (HzNVORF9-like), were homologous to bracovirus proteins. Proteomic analysis showed that these proteins were associated with the bracovirus particles , suggesting that the PmNV proteins might also be structural proteins involved in viral packaging, assembly, or release. Fourteen other PmNV ORFs are homologous to nudivirus and bracovirus genes/ORFs with miscellaneous or unknown functions. PmNV024 most closely matched the HzNV-1 p51 gene (BLASTP: E = 4 × 10-9) (Table 4), which is a late expression gene that putatively acts as a late regulator with unknown function . PmNV038 and PmNV046 have both been annotated previously as thymidine kinase (tk) . However, we found that PmNV038 was homologous to Hz2V034, which has a guanosine monophosphate kinase (GMPK) motif at position 57-96 aa and is annotated as a guanosine monophosphate kinase . In Hz1V111, Hz2V034 and PmNV038, the conserved catalytic GMPK motif, G-X2-G-X-G-K has one mismatched amino acid at the second G position, but it is not known if this affects the putative functionality of these proteins. PmNV046 contains an AAA (ATPases associated with diverse cellular activities) domain (Pfam: E = 0.0013), which implies that this protein belongs to the large, functionally diverse P-loop NTPase family. Proteins in this family are involved in a range of biological processes, including DNA replication, gene regulation, protein degradation, and signal transduction. PmNV098 most closely matched HzNV-2 esterase/lipase (BLASTP: 3 × 10-4) (Table 4). These proteins include the Aes (prokaryotic acetylesterase) signature (CDD: E = 6.19 × 10-5), which suggests that PmNV098 might function as an enzyme involved in lipid metabolism. Most of the PmNV homologs were found in the genomes of HzNV-1 and HzNV-2, and there was a higher similarity to genes from these two species than to the genes from other species. This is consistent with the results of the phylogenetic analysis, and provides further evidence that among the completely sequenced viruses, the Heliothis zea and Helicoverpa zea nudiviruses are the two species most closely related to PmNV. Although the results of our phylogenetic analysis and search for ORF homologs suggest a close relationship between PmNV and the non-occluded nudiviruses, Figure 3 shows that a PmNV -infected nucleus contains enveloped virions that are embedded in approximately spherical occlusion bodies (OBs). The production of these OBs is one of the main reasons why PmNV was previously assigned to the baculoviruses. Transmission electron micrographs of PmNV-infected postlarval Penaeus monodon hepatopancreatic cells. (A) Occlusion bodies (OBs) and free virions (FV) in the nucleus. (B) Occluded virus (OV) in the occlusion body which consists of a polyhedrin matrix. (C) Free virions in the nucleus. 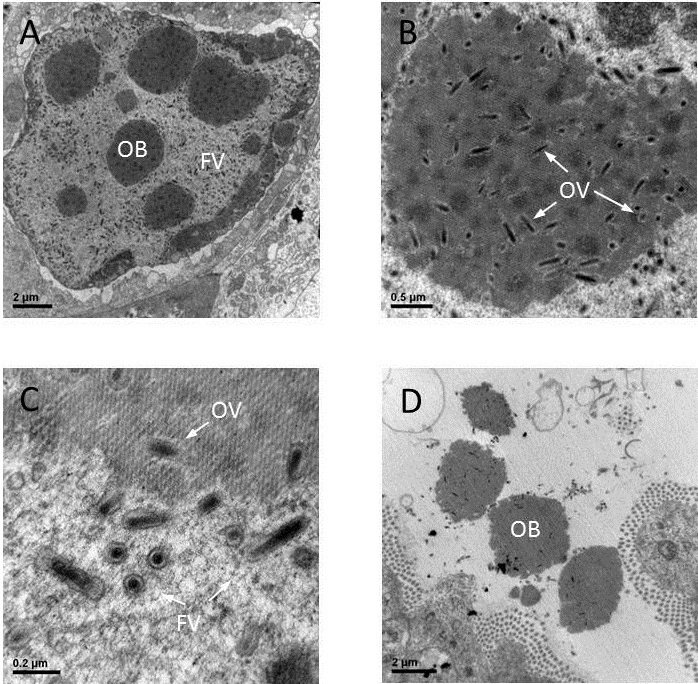 (D) Mature released OBs in the tubule lumen of the hepatopancreas. An OB is a highly ordered crystalline protein matrix produced by some insect viruses (Baculoviridae, Entomopoxvirinae and Cypovirus) and shrimp viruses (PmNV and PvSNPV) that enables the virus to survive in a hostile environment. OBs protect the virions for long periods, and in baculoviruses they act as a per os delivery system by resisting solubilization until exposed to the host insect’s alkaline midgut . The OBs of PmNV consist of a polyhedrin protein that does not have any significant sequence similarity to any known proteins in GenBank, but TBLASTN found a partial PvSNPV nucleotide sequence of unknown function that had 47% identity and an E-value 5 × 10-72 (Accession No. : DQ496179) . It has not yet been shown whether or not this sequence is involved in the formation of PvSNPV OBs. However, both PmNV and PvSNPV have distinct, unenveloped spherical and tetrahedral OBs, respectively, and these are quite different from the enveloped OBs of the insect baculoviruses . To study the molecular characteristics of PmNV polyhedrin, we expressed the PmNV polyhedrin gene (PmNV001) using an AcMNPV baculovirus expression system. Sf9 cells were then infected with recombinant AcMNPV-polh (PmNV) (i.e., AcMNPV with its normal polyhedrin gene replaced by that of PmNV) or wild-type AcMNPV (i.e., carrying its normal polyhedrin gene) and by 3 dpi, significant numbers of occlusion bodies had accumulated in the nuclei of both infected cell types (Figure 4A). 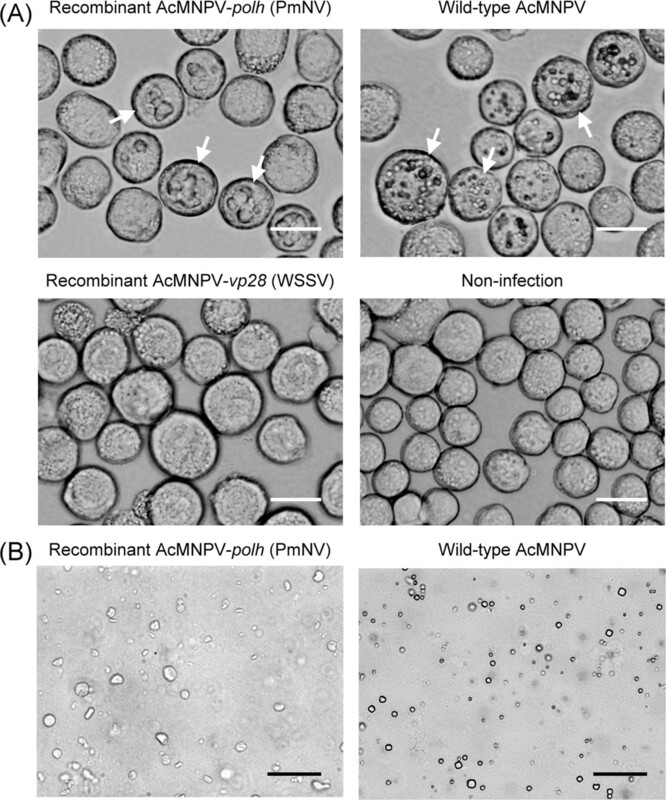 By contrast, cells infected with recombinant AcMNPV-vp28 (WSSV) were swollen and had a larger nucleus than the normal uninfected cells, but no occluded protein packages were seen inside the cells (Figure 4A). This result indicates that PmNV polyhedrin can aggregate into a protein matrix naturally and form a stable structure in the cells. After 5-7 days of virus infection, most of the cells showed a serious cytopathic effect, and yielded large amounts of polyhedrin protein and AcMNPV OBs.After purification of the recombinant PmNV polyhedrin matrices and the AcMNPV OBs, the light-refractive polyhedral AcMNPV OBs were more easily visualized than the irregularly shaped and larger recombinant PmNV polyhedra (Figure 4B). This result suggests that the assembly of PmNV polyhedrin might need other viral or host factors that are absent from the insect expression system to form PmNV wild type spherical OBs. 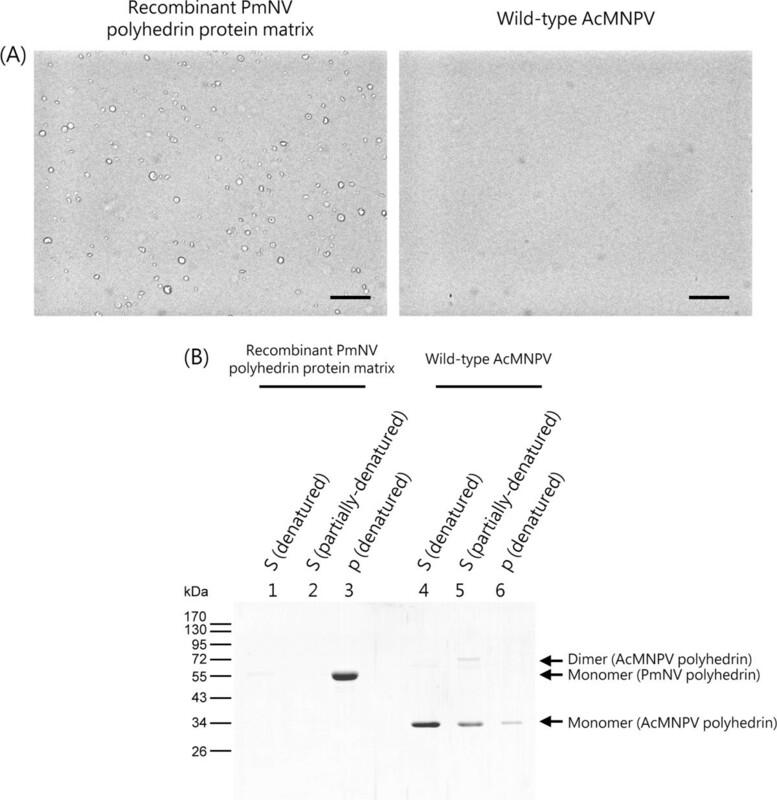 The polyhedrin protein matrix and occlusion bodies (OBs) production of recombinant AcMNPV- polh (PmNV) and wild-type AcMNPV in Sf9 at 3 days post-infection. (A) Photomicrographs of Sf9 cells infected with recombinant AcMNPV-polh (PmNV), wild-type AcMNPV, recombinant AcMNPV-vp28 (WSSV) as non-occluded control and non-infected cells (Normal cells). Examples of cells producing polyhedrin protein matrix and OBs are indicated by arrows. (B) Photomicrographs of purified polyhedrin protein matrix and AcMNPV OBs. Scale bars are 20 μm. Dilute alkaline saline (DAS) buffer is commonly used for enhancing in vitro dissolution of baculoviral OBs, and as expected, the polyhedrin from the AcMNPV OBs was found to be entirely dissolved in the supernatant fractions (Figure 5). However, the recombinant PmNV polyhedrin was not dissolved and was found in the pellet. We also note that the AcMNPV polyhedrin bands show that both monomers and dimers were present in the partially denatured fraction. Effect of DAS buffer on purified recombinant polyhedrin matrix and AcMNPV OBs. (A) Photomicrographs of resuspended pellets after centrifugation showing intact PmNV polyhedrin matrix but no AcMNPV OBs. Scale bar represents 20 μm. (B) SDS-PAGE analysis of the denatured and partially denatured supernatant and the denatured pellet. The results show that DAS buffer did not solubilize the recombinant PmNV polyhedrin (S lanes 1 & 2) but did solubilize polyhedrin from AcMNPV OBs (S lanes 4 & 5). S: supernatant; P: pellet. Additional solubility analysis revealed that 2% SDS and 8 M urea were able to dissolve recombinant PmNV polyhedrin by respectively breaking the protein’s hydrophobic interactions and hydrogen bonding (Figure 6). Acid treatment was also able to dissolve the PmNV polyhedrin. We further note that when the supernatant fraction was only partially denatured, the presence of the polyhedrin bands after 8 M urea and acid treatment shows that only these two treatments were able to induce complete dissolution of the PmNV polyhedrin matrix to the monomeric protein. Solubility of purified recombinant PmNV polyhedrin and wild-type AcMNPV. (A) Photomicrographs of pellet samples after indicated treatments showing presence or absence of PmNV polyhedrin matrix or AcMNPV OBs. Scale bars 50 μm. (B) SDS-PAGE analysis of pellets and supernatant solutions from treatments in (A). Lane 1: TE buffer (negative control); Lane 2: 2% SDS; Lane 3: 8 M urea; Lane 4, 5 and 6: phosphate buffer adjusted to pH 2, pH 7 and pH 10, respectively. By contrast, when the same treatments were applied to purified AcMNPV OBs, only 8 M urea was able to induce dissolution of the OBs into polyhedrin monomers and an extremely faint band of dimers (Figure 6B). Although most of the AcMNPV polyhedrin was solubilized in the presence of 8 M urea, the bands in lane 3 of the supernatant fractions were fainter than expected. We speculate that this was because the solubilized polyhedrin was digested by a protease that became active in the presence of urea. We also note that although the AcMNPV OBs were soluble in DAS (Figure 5), alkaline conditions alone (pH 10) were not sufficient to dissolve the OBs. This difference may be due to the presence of sodium, carbonate, and EDTA in the DAS buffer . After purifying wild-type PmNV OBs from the hepatopancreas of PmNV-infected postlarvae, we found that, unlike baculoviral OBs, the PmNV OBs were not spun down by 4,000 × g centrifugation for 10 min (Additional file 10: Figure S4). Finally, however, we found that 13,000 × g centrifugation for 30 min was sufficient to spin down most of the OBs, although some OBs still remained in the supernatant. A further examination of the effects of different buffers on the PmNV OBs found that only acidic conditions were able to induce PmNV polyhedrin to dissociate into monomers under partially denatured conditions (Figure 7). This result is consistent with the above analysis of the recombinant PmNV polyhedrin protein matrix, and also suggests a possible PmNV transmission mechanism whereby its OBs are dissociated in the acidic environment of the host’s digestive tract. Even though both insect and PmNV OBs are transmitted per os, they show different characteristics that appear to be specifically adapted to the digestive environment of their respective hosts.We also found that wild-type PmNV OBs were solubilized in 1/3 PBS, TE, 2% SDS, 8 M urea and DAS buffer, but were stable in neutral and alkaline phosphate buffer (pH 7 and pH 10) and in 0.6 M NaCl (close to the salt concentration of seawater) (Figure 7A). (The identity of the slight shifted band in lane 4 of the denatured supernatant fraction was confirmed by Western blotting [data not shown]; the shift itself was probably caused by the high concentration of urea.) A high molecular weight polyhedrin complex was observed in the supernatant under partially denatured conditions (Figure 7A, black arrow). The identity of the polyhedrin in these high molecular weight bands was confirmed by LC-MS/MS analysis (data not shown). The results shown in Figure 7A further suggest that ionic strength might affect the solubility of the PmNV OBs, specifically that at higher ionic strengths, the PmNV OBs are more likely to be present in the pellet fraction. To better understand this relationship, we examined the effect of different salt concentrations on the PmNV OBs, and found that solubility increased from 0.6 M NaCl to 0 M NaCl (Figure 7B). Solubility of purified wild-type PmNV OBs in various buffers and different concentrations of NaCl. (A) SDS-PAGE of supernatant solutions (soluble) and pellets (insoluble) after PmNV OBs were subjected to the treatments indicated. Black arrows indicate partially denatured PmNV OBs. (B) Western blots of supernatant solutions (soluble) and pellets (insoluble) from PmNV OBs treated with various concentrations of NaCl and showing increasing solubility as salinity decreases. In addition to showing the basic features of PmNV OBs, these results suggest that instead of the more typical protective role of the AcMNPV OBs, PmNV might in fact use OBs as part of its natural transmission strategy. One possible pathway of viral transmission is as follows: After the mature PmNV OBs are released, the high ionic strength of the seawater environment helps to maintain the integrity of the PmNV OBs and even allows physical association of large numbers of OBs with shrimp feces or the bodies of dead shrimp. Subsequently, when healthy shrimps ingest these PmNV OBs, the OBs become solubilized in the lower ionic strength conditions of the shrimp’s digestive tract, and then dissociate in the acid midgut. After the virions are released from the OBs, they can then infect the midgut epithelium cells to complete the viral transmission. Nudiviruses were historically regarded as baculoviruses because both groups share similar characteristics, including rod-shaped, enveloped virions, a circular dsDNA genome, and replication in the infected nucleus. Eventually, in 1995, nudiviruses were removed from the family Baculoviridae due to low genetic similarity , but their taxonomic classification continues to be debated. While PmNV has characteristics that are shared both by the nudiviruses and the baculoviruses, it initially seemed more like a baculovirus than a nudivirus because of its OBs. However, the results of the present study provide further evidence that this relatively unique virus does not comfortably belong to any of the present baculovirus genera. Instead, we would argue that PmNV properly belongs within the newly proposed taxonomy of the Nudiviridae family . This is despite the fact that our phylogenetic analysis suggests that the evolutionary distance between PmNV and the nudiviruses is greater than the distances between any of the four genera (Alphabaculovirus, Betabaculovirus, Gammabaculovirus and Deltabaculovirus) of the Baculoviridae (Figure 2). We also recognize that the host range of PmNV is distinct from that of the other nudiviruses. Nevertheless, when we followed Jehle et al. and used several taxonomically important genes to construct a phylogenetic tree, we found that, as in Figure 2, PmNV once again clearly forms a separate clade within the nudiviruses (Figure 8). We therefore propose that PmNV should be assigned to a third nudivirus genus, Gammanudiviruses. 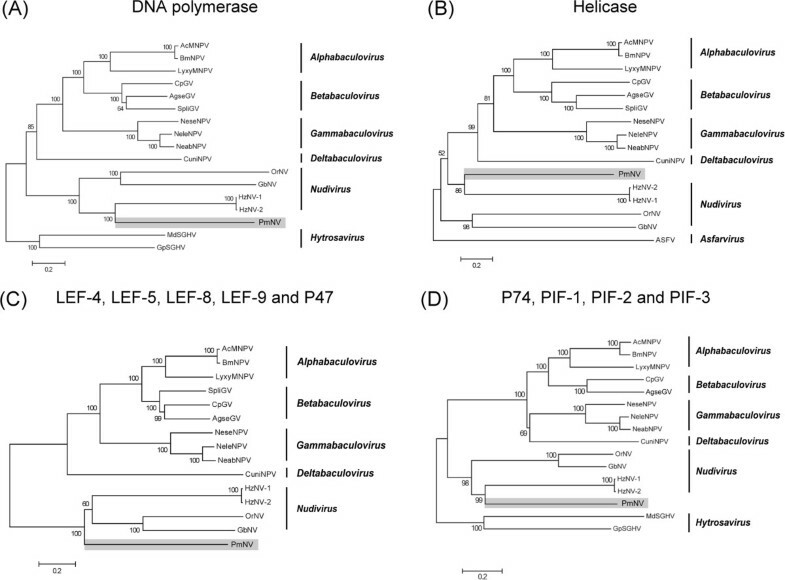 Phylogenetic analysis of the concatenated protein sequences of LEF-4, LEF-5, DNA polymerase and Ac81 from PmNV, the nudiviruses, and four baculoviruses. This analysis follows Jehle et al.. The tree was inferred using MEGA 5.2 and the neighbor-joining method. Robustness was tested using bootstrap (1000) analysis. Percent values are indicated at the nodes. Jehle et al. proposed that the nudiviruses should be assigned to one of two new genera. Alphanudivirus and Betanudivirus. We propose here that PmNV should be assigned to a third new genus, Gammanudivirus. The PmNV used in this study was originally collected from infected Peneus monodon Indonesia on May 23, 2007, and provided to us by the GeneReach Biotech biotechnology company (stored at -80°C). To prepare purified virus, P. monodon postlarvae (PL2) were infected per os with PmNV by feeding them with infected postlarvae that had died. Infection was monitored by randomly collecting PLs, and using a microscope to examine the PmNV occlusion bodies in squash mounts of hepatopancreas stained with 0.05% malachite green. In addition, PmNV infection status was confirmed using an IQ2000 detection kit (GeneReach). At 2 weeks after infection, severely infected PL15 were collected and stored at -80°C. Frozen PmNV-infected PL15 were homogenized in TESP buffer (50 mM Tris-HCl, 500 mM NaCl, 10 mM EDTA and 200 mM PMSF, pH 8.5) using a glass pestle (kept on ice), with the addition of TESP with 10% sucrose buffer (final volume 50 ml). To remove the occlusion bodies and cell debris, this mixture was then centrifuged (8,000 × g for 20 min at 4°C) and the supernatant was filtered successively using gauze, followed by 0.8 and 0.45 μm filters. Thereafter, the free extracellular virions in the filtered supernatant were centrifuged (30,000 × g for 1 h at 4°C). The supernatant was removed, TESP with 10% sucrose buffer was added and the mixture was centrifuged (30,000 × g for 1 h at 4°C) to wash the pellet. The supernatant was discarded and the pelleted virus was re-suspended in TM buffer (50 mM Tris-HCl, 10 mM MgCl2, pH 7.5). Two methods were used to obtain viral genomic DNA. As explained below, the first method used DNase I treatment and gel elution to achieve higher purity, while the second method did not use DNase I.
Purified virus was treated with 0.25 μg/μl DNase I (Bioshop) at room temperature for 1-2 h to digest the host DNA. Then, virions were collected by high speed centrifugation (30,000 × g for 1 h at 4°C). Viral genomic DNA was extracted by the DTAB/CTAB method (GeneReach), and then separated on a 0.6% agarose gel; the DNA comprised a high molecular weight major band, which was transferred to DE-81 paper (Whatman) by electrophoresis. This paper (with the DNA) was placed into a custom-made plastic spin column and washed twice with 200 μl low salt buffer (10 mM Tris-HCL pH 7.5, 1 mM EDTA, and 100 mM LiCl) by centrifugation (30,000 × g for 1 h at 4°C). Thereafter, DNA was eluted with 200 μl of high salt buffer (10 mM Tris-HCl pH 7.5, 1 mM EDTA and 1 M LiCl) and 200 μl n-butanol was added to remove EtBr. The genomic DNA was then precipitated overnight at -80°C by adding 20 μl 3 M NaOAc (pH 5.2) and 550 μl 100% ethanol. After centrifugation, the supernatant was discarded, and the DNA pellet was washed with 200 μl 70% ethanol and air-dried for 5-10 minutes. Finally, the DNA was dissolved in 10 μl ddH2O and stored at -20°C. For this step, DNA was extracted using DTAB/CTAB method (GeneReach) described above, with the exception of DNaseI treatment. Viral genomic DNA that had been treated with DNase I was initially used for high-throughput sequencing. First, about 50 ng of this DNA was used for a fragment library (insert length: 300-500 bp) using the Chip-seq method to amplify DNA (which increased PCR bias) and a paired-end method was used for sequencing following the Ovation® Ultralow Library System instruction. Subsequently, viral genomic DNA not treated with DNase I (DNA concentration is about 10 μg) was used for the second high-throughput sequencing, preparing the DNA library according to Miseq instruction (average insert length: 170 bp). The Cutadapt program (http://code.google.com/p/cutadapt/) was used to trim the raw data and to reject poor-quality reads. CLC Genomics Workbench 5.1 software (CLC bio) was used for de novo sequence assembly. Based on the longest contig, 240 primers were designed to amplify ~1,500 nt PCR fragments with 500 nt overlaps (see Additional file 1: Table S1 in the supplemental material for primer sequences). These fragments, which covered the entire virus genome, were sequenced by the Sanger method (first generation sequencing). Subsequently, 134 additional primers (Additional file 1: Table S1) were designed to verify sequences with unreliable signals. Repetitive sequences were identified by tandem repeat finder  and DNAMAN software (Version 7, Lynnon Corporation, Pointe-Claire, QC, Canada). The ORF predictions were performed by DNAMAN (parameter: coding more than 50 amino acid), GLIMMER3  (parameter: standard code and circular genome type), GeneMarkS  (parameter: Intronless eukaryotic-virus) and FgenesV0 (standard code and circular genome type; http://linux1.softberry.com/berry.phtml) programs. Any ORF predicted by at least two programs or with an E-value less than 1 of BLASTP (http://blast.ncbi.nlm.nih.gov/) were subjected to a database search to identify possible functions. The protein sequence of predicted ORFs were further searched for conserved domains and structure prediction by PROSITE , SMART , Pfam  and HHpred  by the online database. Protein sequence comparisons (Tables 2 and 3) were aligned by ClustalX2  and protein identity and similarity were characterized using GeneDoc . Infected hepatopancreas (4-8 d post-infection) were prefixed in 2.5% glutaraldehyde and 2% paraformaldehyde in 0.1 M phosphate buffer (PBS) at 4°C overnight. Samples were transferred to a glass tube and rinsed with 0.1 M PBS (3 times, each for 10 min). Then, 1% osmium tetroxide was used to postfix the tissue at room temperature for 90 min. Fixed samples were treated with 0.2% uranyl acetate (overnight at 4°C) and dehydrated on ice (serial concentrations of 70, 80, 90 and 95% alcohol, each for 10 min). The final step of dehydration used two exposures to absolute alcohol at room temperature (each 15 min), followed by two exposures to acetone (each 15 min). Samples embedded in Spurr-Epon were cut into ultrathin sections on a Reichert OMU ultramicrotome and stained with uranyl acetate and lead citrate. The PmNV polyhedrin gene (PmNV 001) was cloned into pBacPAK9 (Clontech) (an expression system based on the baculovirus AcMNPV genome in which the original viral polyhedrin gene has been replaced by a cloning site for heterologous gene expression) with BamHI and NotI restriction sites (p5841-polhFL-BamHI-F: 5′-GCCGGATCCATGTTCGACGATAACATGATG-3′ and p5842-polhFL-NotI-R: 5′-GATTGCGGCCGCTTCATTTGTATGATGCGTCTT-3′) and recombinant baculoviruses were produced by co-transfection of linearized baculoviral DNA, using BacPAK™ Baculovirus Expression System (Clontech) in accordance with manufacturer’s instruction. Then, Sf9 cells (Novagen) were cultured in SF900™ II SFM (Gibco) medium supplemented with 10% FBS (Gibco) at 28°C. In Sf9 cells infected with P2 progeny of PmNV polyhedrin recombinant baculoviruses, a polyhedrin protein matrix was present. At 7 d after infection, Sf9 cells with overt signs of infection were lysed (TE buffer with 0.1% SDS, vortexed for 5 min), washed twice with TE buffer, and recombinant polyhedrin protein matrices collected by centrifugation (4,000 × g for 10 min). Wild-type AcMNPV strain (AcMNPV-TWN4), isolated from beet armyworm, Spodoptera exigua[65, 66], was provided by Professor Chung-Hsiung Wang (National Taiwan University). At 7 d after AcMNPV infection, Sf9 cells were lysed by TE buffer with 2% SDS and sonicated for 5 min. The AcMNPV were obtained by centrifugation (4,000 × g for 10 min) and washed twice by TE buffer. The WSSV (White spot syndrome virus) vp28 gene was cloned into pBAC-1 transfer plasmid (Novagen) with EcoRI and XhoI restriction sites (p5274-VP28-EcoRI-F: 5′-GCCGAATTCATGGATCTTTCTTTCACTCTTTCGGTC-3′ and p5275-VP28-XhoI-R: 5′-GTGCTCGAGCTCGGTCTCAGTGCCAGAGTAGGTGAC-3′) and recombinant baculoviruses were produced by co-transfection of baculoviral DNA by BacVector®-1000 transfection kit (Novagen), following the manufacturer’s instructions. Infected hepatopancreases were homogenized by plastic pestle in 200 μl of 1/3 PBS. The cell debris was pelleted and removed by centrifugation (4,000 × g for 10 min). The PmNV OBs were in the supernatant fraction and were subsequently pelleted by centrifugation (13,000 × g for 30 min). Purified polyhedrin protein matrix and AcMNPV OBs or PmNV OBs were aliquoted into each tube and centrifuged (4000 × g for 10 min or 13000 × g for 30 min, respectively). The supernatant was removed and then each buffer (DAS buffer, 1/3 PBS, TE buffer, 2% SDS, 8 M urea in 20 mM Tris, 3 phosphate buffer with different pH value (phosphoric acid were adjusted to pH 2, pH 7 and pH 10 by NaOH and HCl) or 0.6 M NaCl) was added to the pellet in each aliquot for 5 min with vortexing. After incubation and centrifugation, the supernatant and pellet were separately collected and subjected to SDS-PAGE. Supernatant fractions were denatured by mixing 10 μl of supernatant with 10 μl of 2 × Laemmli buffer  and boiling the mixture. Partially denatured supernatant fractions were prepared by mixing 10 μl of supernatant with 10 μl of 2 × Laemmli buffer without β-mercaptoethanol and boiling the mixture. Denatured pellet fractions were prepared by adding 20 μl of 1 × Laemmli buffer and boiling the mixture. Thereafter, proteins were separated using SDS-PAGE. The C-terminus of polyhedrin (residues 251-452)  was amplified and sub-cloned to pET-16(b) expression vector (Novagen) with NdeI and BamHI restriction sites (p5786-polh-251-NdeI-F: 5′-CGTCATATGTCAGAAAATACTTCTATACAA-3′, p5787-polh-452-BamHI-R: 5′-GCCGGATCCTTATTCATTTGTATGATGCGT-3′). 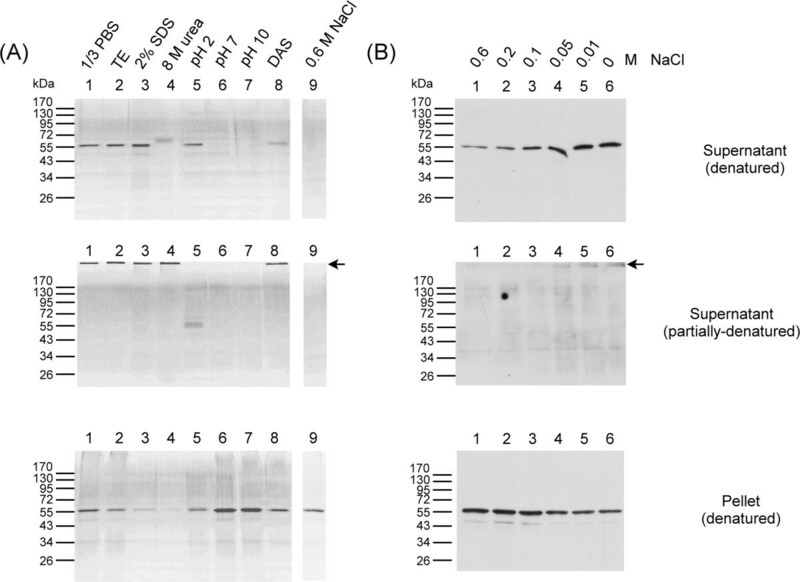 The recombinant polh-C containing a His-tag at the N-terminus was expressed by E.coli BL21 (DE3) cells at 37°C for 3 h. Thereafter, E. coli were collected by centrifugation (6,000 × g for 10 min) and sonicated for 20 min in 5% glycerol in PBS. The recombinant polh-C was solubilized with 1.5% sarcosine and purified using Ni-NTA beads (Qiagen). The binding beads were washed 3 times, 4 × Laemmli buffer was added, and then proteins were separated using 12.5% SDS-PAGE. The purified protein was remove from the polyacrylamide gel and injected into rabbit to produce the polyclonal antibodies. Wild-type PmNV OBs were separated by SDS-PAGE and transferred to a polyvinylidene difluoride membrane (Amersham). The membrane was blocked in 5% skim milk at 4°C overnight and incubated with anti-polyhedrin antibody (1:10,000) at room temperature for 1 h. Anti-rabbit immunoglobulin G antibody (Santa cruz) conjugated to horseradish peroxidase (1:10,000) was used as the secondary antibody. A chemiluminescence system (Perkin Elmer) was used for detection. The PmNV genome sequence was submitted to GenBank under accession number KJ184318. The complete PmNV genome sequence has been submitted to GenBank (accession number KJ184318). The phylogenetic tree shown in Figure 2 has been deposited in TreeBase http://purl.org/phylo/treebase/phylows/study/TB2:S15937. All supporting data is included as additional files. We thank Tsan-Chi Chen, En-Min You and Chun-Hsin Lu for their technical support regarding the PmNV genome sequencing and assembly; Prof. Chun-Hua Hsu of National Taiwan University, Department of Agricultural Chemistry and Hao-Ching Wang of Taipei Medical University, The Ph. D. Program for Translational Medicine for their insights into polyhedrin protein structure; and Dr. Yu-Shin Nai, Tai-Chuan Wang, Chin-Yu Wu and Prof. Chung-Hsiung Wang for providing baculovirus materials and expertise. We thank Technology Commons in College of Life Science and Center for Systems Biology at National Taiwan University for providing experimental and data-analysis support. We also thank Dr. Kuan-Fu Liu of Tung Kang Marine Laboratory, Taiwan Fisheries Research Institute, for providing the cultured postlarvae of P. monodon. We are indebted to Paul Barlow and John Kastelic for their helpful criticism of the manuscript. This work was supported by a National Science Council grant (NSC 102-2313-B-002-021) and the National Natural Science Foundation of China (Grant No. 41376135). GHK and CFL conceived the research. YTY, YGW, JMH, WHL, JHL, GDC, STK, SSL, GHK, and CFL designed the research experiments. YTY, YGW, JMH and CFL participated in the genome sequence analysis. YTY, WHL, HMK and CFL carried out the phylogenetic tree analysis. YTY, SSL and CFL carried out the NGS data analysis. YTY and DYL performed the PmNV polyhedrin experiments. YTY, DYL, YGW, WHL, JHL, GHK and CFL wrote the manuscript. All authors have read and approved the final version of the manuscript.